NEW YORK — Over 900 influencers, media and VIPs packed NYC’s Iconic Gotham Hall to celebrate NaturallyCurly’s signature event Texture on the Runway last week during New York’s Spring 2019 Fashion Week to celebrate the beauty of curls and coils. 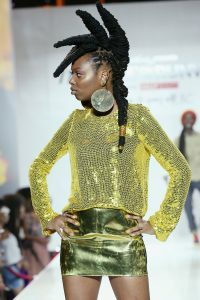 Retailer Sally Beauty returned as the retail sponsor for the innovative runway show that puts textured hair front and center. This year’s event was also a celebration of NaturallyCurly’s 20th anniversary. The media company has been at the center of a two-decade revolution that transformed the way the world views curls, coils and waves. Since 1998, NaturallyCurly has been the pioneer in empowering, educating and inspiring its community of consumers, influencers, and beauty enthusiasts. By focusing on texture from Day 1, NaturallyCurly has attracted an inclusive community of all ages and ethnicities, men and women, from wavies to super coilies. Hosted by NaturallyCurly co-founder Michelle Breyer, and recording artist and breakout star of Love & Hip Hop Miami Amara La Negra, seven top texture brands showcased their distinctive take on texture down the runway. This year’s runway sponsors included Camille Rose Naturals, Cantu, Carol’s Daughter, Creme of Nature, Mielle Organics, SheaMoisture and The Mane Choice featuring their own unique textured hair inspiration and debuting looks that truly celebrate coils, curls and waves as well as fashion. Since NaturallyCurly launched Texture on the Runway in 2012 at City Winery in New York City, it has become one of the most anticipated events in the natural hair community. The innovative runway show arose out of NaturallyCurly co-founder Michelle Breyer’s frustration that Fashion Week lacked inclusivity. Texture on the Runway puts curls, coils and waves front and center, letting the hair inspire the fashion rather than the other way around. Brands are encouraged to take their interpretations of texture down the runway, from intricate protective styles like braids and twists, to cascading curls or big luscious ‘fros. In recent years, the brands’ creativity has expanded well beyond the hair and fashion. This year, Cantu’s presentation featured a true New Orleans second line band. SheaMoisture integrated a reggae soul performance by Meta and the Cornerstones and Carol’s Daughter energized the crowd with an electrifying dance group, The Red Project NYC. Theme: Carefully sourced ingredients meet exotic recipes. The diverse regions that create the new Around the World collection’s ingredient pallet was the inspiration backdrop to the Camille Rose presentation. The stage was transformed into a dramatic oasis of rich cultural fused interpretations using wardrobe, color design, music and the centerpiece of hair! The audience was invited to take a trip with us to the Amazonian Rainforest, South Pacific and the Middle East via a sensory overload presentation; which borrowed cues from this new exotic collection of conditioning treatments and oils. The Around the World collection launches at Sally Beauty during Texture on the Runway 2018. Theme: The Faces of Cantu: Head Over Heels for Texture. We have an extremely dedicated and hardworking team, each of us doing what we love for consumers we love. Our theme showcased that love and dedication to the textured hair movement, while putting a spotlight on some of our most dedicated team members from sales, marketing, and even one of our interns. Our stylist, Maria Antoinette is an industry icon for her creative, yet somehow achievable hairstyles for naturalistas. Our textile designer and artist, Melissa A. Mitchell of Abeille Creations, along with Tailor Soila Konchellah, decorated our team with wearable art worthy of an exhibit. Last but not least, our Stylist and Creative Director, Morgan A. Wilder is the talent behind pulling everything together for a cohesive, runway-ready show that we’re proud to bring to New York Fashion Week with Texture on the Runway. For Texture on the Runway, we recreated these special moments shared between, mother, and child by using models that are actual family. Lead Stylists Derick Monroe and Gabrielle Corney using the Pracaxi Nectar style and care line to create styles that celebrated each models uniqueness as well as their family bond. Theme: At Creme of Nature we are shifting the culture and redefining the future of universal style and texture…with a bold Afrofuturism hijacking of the runway. The “Afro Punk Urban Queen” is fearless in her diverse expression of edgy street fashion, multicultural hairstyling and glow up beauty – which all reflect the glamorous ornamentation of her #BlackGirlMagic that extends to every corner of the globe. This supernatural goddess embodies a generation of boss ladies setting trends all over the world. The Afro Punk Urban Queen has grinded her way from the bottom to the top and from the streets to C-Suites, while empowering her beloved brothers and sisters on the journey. Theme: Mielle Organics hit the runway with an edgy presentation that brought the brand to life. Hairstyles and looks were crafted and inspired by the woman warriors of Wakanda. Mielle Organics’ lead stylist Key Glover delivered edgy and dramatic looks. Hair was styled using the Pomegranate and Honey collection, including the three newest additions to the line: Moisturizing & Detangling Shampoo, Moisturizing & Detangling Conditioner and Curl Refreshing Spray. Supporting sponsors included: As I Am, Aunt Jackie’s, ORS Curls Unleashed, Maybelline, Reshma Beauty, Smooth ‘N Shine and Tone Skincare.